Galway County Council is currently seeking submissions from members of the public regarding what to do with the site of the Bon Secours mother and baby home in Tuam, Co Galway. The deadline for submissions is this Friday, March 16. Imagine you are 70 years old. Throughout your life you have dealt with the stigma of being branded as ‘illegitimate’ and your long quest to find your birth mother had ended in a Magdalene Laundry, where she had lived for over 30 years. You used to visit her every fortnight, after managing to track her down, although the nuns warned you to pretend that she was your aunt. They told you they would prevent you from visiting if you told the other inmates the truth about your relationship with your own mother and it used to pain you to see the defeat, the lack of sparkle, in her eyes. Together with the other inmates, she washed and cleaned the clothes of the great and the good around the city and county. For years, she never ventured outside the laundry walls even though she was just minutes from the heart of the city. But you kept the relationship going, and enthused about how her spirit lifted just a little after you married and she met her first grandchild. You saw flickers of her spirit on occasional weekend visits to the seaside, when the nuns finally started to allow her out of the laundry for a few hours. She was buried in 1989, in a grave she shared with other women from the laundry. You hoped that she was resting in peace after a tough life and you got on with your life. And then, four years ago, your life was turned upside down once again. Historian Catherine Corless, who has since become a good friend, was on the other end of the phone. She told you the startling news that you had a little sister nobody had ever told you about. She was one of the 796 ‘Tuam Babies’, who were making headlines all across the globe. Catherine’s painstaking research had placed one of the little babies in the tiny townland in your mother’s rural community. When you asked around, you discovered it was true. Your mother had given birth to a second child before being locked up again for years. For all you knew, that little girl was buried in that infamous septic tank in Tuam. But, that’s the thing. You didn’t know. For all you know now, too, she was adopted by a loving family in the US or the UK, because nobody has any records of your little sis and what became of her after being born in that now notorious Mother and Baby Home. That’s what happened to Peter Mulryan, a remarkable man whose quest for justice for his little sister goes on. Now aged 74, he has been stonewalled by the authorities. He’s concerned that they will mark the site with a memorial, before he ever finds out what happened to her and whether or not she ended up in that terrible place in Tuam. 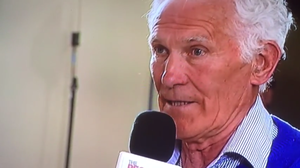 On Sunday, he spoke movingly about giving a voice to the voiceless and the need to heal the hurt caused to generations of Irish women and their ‘illegitimate’ children. A year ago, he brought a graveyard to tears when he spoke about his quest for justice, to find out the truth about the sister he never knew he had. He returned to that graveyard on Mother’s Day, to pay tribute to his mother and all the other mothers who had been locked up in Magdalene Laundries across Ireland. It is believed there were 10,000 of these women locked up in institutions throughout Ireland right up until the 1980s. Many, but not all, were single mothers who were taken away from their families to hide their ‘shame’. And now Peter Mulryan, like the other survivors, is wondering what is going to become of their loved-ones. 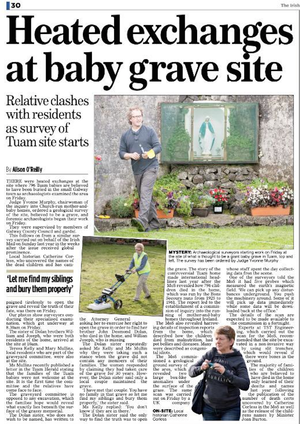 They believe the Tuam site should be examined and the bodies of the infants exhumed. They want DNA testing to be carried out on the little ones, but they are concerned now that the Irish authorities will cover up the site and just put in a memorial plaque on the unofficial burial ground. Galway County Council is currently seeking submissions from members of the public regarding what to do with the site. The deadline for submissions is this Friday, March 16. Family members like Peter are concerned that the local authority may decide to put a memorial in place at the site of the former septic tank rather than the more costly option of a thorough examination. The council has listed five options for the site. “I’m still looking for my sister. I want her file, to see what happened to her. The council are only adding more pain and hardship to the families. I would like to ask the officials how they would feel if they had a family member in the septic tank there. That’s what I ask them when I meet them and they just go cold,” he said, following a memorial service for the women of the Magdalene Laundry in Galway on Sunday afternoon. “Those children could not be baptised. That ground was never consecrated. The authorities won’t tell us that they are sorry or admit that they were wrong. Mr Mulryan said he could not accept the argument that a full forensic examination of the Tuam site would cost too much at this stage. Speaking beside his own mother’s shared grave, he pointed out that many of the mothers worked for free after being incarcerated in the Magdalene Laundries for decades. “When you think of the money which was made out of these women, slaving for free in these laundries, it’s unbelievable the way they are still treating us,” he said. 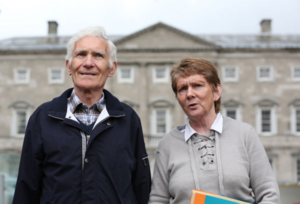 Breeda Murphy of the Tuam Home Survivors’ Network said the Government should have declared the site a crime scene after Catherine Corless’ research was vindicated this time last year. Ms Corless also faced hostility or indifference from the authorities when she researched what happened to the babies who died at the Tuam home. “The people who have family members at the Tuam site want to bring them home and give them a proper burial. There’s nothing dignified in concealing children in a structure which was first built to contain sewage or human waste. You can never get away from that, regardless of the time period or saying that that was how things were done back then,” said Ms Murphy on Sunday. A survivor of the Magdalene Laundry in Galway, Angela Fahy, said families also had to take responsibility for their role in the incarceration of women in the Magdalene Laundries. She said there were 110 women in the Galway home when she was locked up there at just 14 years of age. “These women were put there in secret, died there in secret, and buried there in secret,” she said. 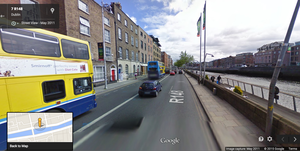 “Their neighbours in Forster Street did not even know them. These women washed and cleaned the clothes of this entire province. Many of them never came out of there alive. 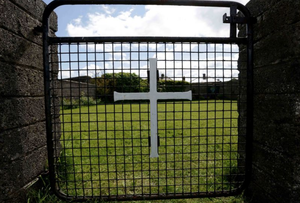 A year has passed since confirmation that the bodies of babies who died at the home between 1925 and 1961 were found at the site of the former Tuam Mother and Baby Home, which was run by the Bon Secours order of nuns. Campaigners, who want the babies to be given proper burials in consecrated ground, have been inundated with messages of support from across North America over the past year. They are insisting that cost should not be the main concern as they seek justice for the 796 ‘Tuam Babies’. 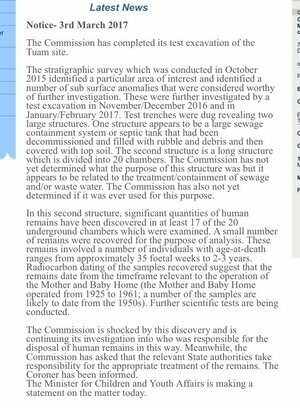 Galway County Council is facilitating a full public consultation process about what to do with the site where the ‘Tuam Babies’ were found, with submissions accepted until this Friday, March 16. Members of the public can email TuamConsultation@galwaycoco.ie or telephone +353 (0)91 509561 if they have any queries regarding the full public consultation process. 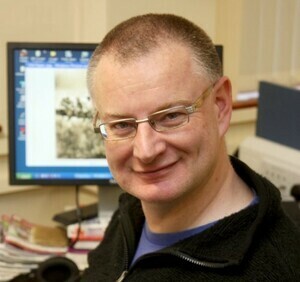 Ciaran Tierney is a journalist, blogger, and digital storyteller, based in Galway. Posted in Misc and tagged public consultation, Tuam Mother and Baby Home at 12:28 pm on March 13, 2018 by Ciaran Tierney. is that official church doctrine? This was all I could think of as I was reading that and getting angrier and angrier as I did…. I would like to submit my suggestions for the Tuam site. I would suggest that all remains are DNA tested and made available to potential family members prior to any more works being completed, in line with international standards of dignity and family reunification principles. This is the minimum that the families should be allowed to expect, furthermore it is the courtesy extended to families in extreme poor and war torn countries, provided as in line with the humanitarian standards. “More often than not in these situations, those who are missing are dead. The only relief for their families is receiving credible confirmation of the death and knowing that the remains of their relative have been or can be treated with dignity, in keeping with their culture and religious beliefs. The proper recovery and identification of human remains is thus a fundamental part of the healing process for families and even whole communities”. 1. To inform first responders of the importance of supporting the bereaved. 2. To ensure that the bereaved are considered and respected throughout the process. Overview 1. The dead and the bereaved should be respected at all times. 2. The priority for affected families is to know the fate of their missing loved ones. 3. Honest and accurate information should be provided at all times. 4. A sympathetic and caring approach is owed to the families throughout the process. 5. Psychosocial support for families and relatives should be considered. 6. Cultural and religious needs should be borne in mind throughout the process. Until these conditions are met, I’m not sure any decision can be made regarding the remains of those resting in Tuam. It should be a consultation with living family members. These are people with family. If the case was so old as to have no more living relatives – then it should be refereed to public consultation. good job, just sent mine in now. Thank you….very well written…below is a web-link to the PDF you mention (your link wont work for anyone not sitting at your PC :) ) if you want to double check its the same thing..
Thats a fantastic submission RCA. Getting mine in now. Is there anywhere else in the world where you find a mass grave full of people who’s deaths were not recorded and their response is to have a PUBLIC CONSULTATION on what to do about it? If it was one baby’s body discovered, would it be left there? Left investigated? Why is it a source of consternation when it’s hundreds? Typical lack of respect and accountability in this country. We all know that the government facilitated this via the Catholic Church. They may not have been directly responsible but they sure didn’t have a problem turning their backs on such abhorrent practices, if it meant they didn’t have to deal with those unmarried sluts and their bastards. I have nothing to add but to say this is heartbreaking. I am so ashamed that we continue to treat survivors of these institutions, and their families, with so little dignity. Congregations need to be formally seized.